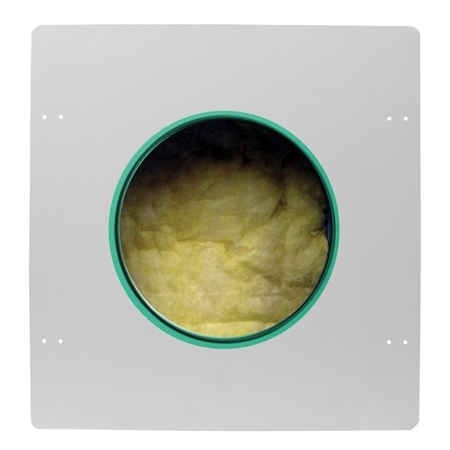 The ME-800-C fire-rated speaker enclosure allows installers to meet building codes as well as diminish the undesirable transfer of sound from one room to the other. Designed to fit all Reference Series in-ceiling speakers with 8-inch woofers the ME-800-C allows residential contractors to meet building codes as well as diminish the undesirable transfer of sound from one room to the other. The ME-800-C is manufactured from high-grade cold-rolled steel and features a layer of insulation. It exceeds the one-hour fire-rating requirements and is designed to meet UL2043 requirements for installation in plenum spaces. This metal device has also been tested to meet UL 263 ASTM E119-98 NFPA 251 UBC 7-1 and ULC CAN/ULC-S101 - M89 standards. The ME-800-C fits 16- or 24-inch stud spans. It also comes with all of the hardware needed for most installation applications and provisions for standard conduit connections. Pre-drilled holes simplify the installation process and ensure that all safety requirements are met. The optimized enclosure volume provides consistent acoustic performance regardless of construction variations. While the insulation exceeds fire requirements it also reduces the sound transmission into adjacent spaces by at least 10dB. The inside edge of the ME-800-C's mounting ring is color coded to match up with the corresponding Klipsch installation kit size code.